Las Vegas has long been known as one of the easiest places in the country to get married. All you need for a license is proof of your identity and enough cash to cover the costs. With license in hand, you can then choose from one of more than 50 chapels in the Las Vegas area. However, Las Vegas wedding chapels aren’t just for the kind of spur-of-the-moment marriage decisions that an exciting weekend in Vegas can inspire. 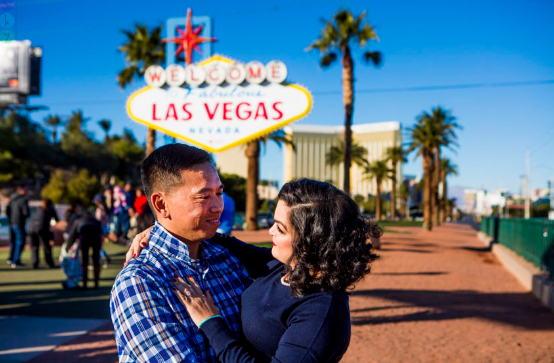 You can make a Vegas wedding a romantic and playful start to your life together. Decide when you want to have your wedding. Vegas has the fewest visitors immediately after New Years, and in July and August. If you go in those off season times, you’ll find cheaper rates throughout Las Vegas. The weather is usually comfortable in January, but you’ll be battling extreme desert heat if you visit in the summer. Create your guest list well in advance so you can find a wedding chapel that seats everyone you want at your wedding. The Elvis Wedding Chapel of Las Vegas advertises itself as the largest chapel in town, seating 120 people. Of course, if you just want a handful of friends—or only the two of you—you can bypass this step. Book a chapel well in advance if you want a themed wedding or a package, such as a wedding that also includes limo service or an on-site reception. For a sampling of the types of themed weddings you can experience, check out the list at Viva Las Vegas Weddings. This chapel also offers more traditional wedding packages, which you’ll also find at other chapels throughout Vegas. Discuss payment, including tips, when you book your wedding. If you’re just going to do a walk-in service, you may want to call a few chapels ahead of time to find out expected tip rates. Generally, the minister’s fee is included in the wedding fee, but if you want a themed wedding where the minister doubles as an actor or character, such as Elvis, you’ll need to figure in extra money for the minister. If there are additional participants—especially characters—you should plan on tipping them. An average tip is about $25. Head down to the Clark County Wedding Bureau at 201 Clark Ave. with your intended and your identification. To speed things up, you can fill out your license application online, print it out, and bring that along. However, if you’re there during peak travel season, expect a line. As of 2009, the cost for the wedding license is $60 and must be paid in cash. Arrive at the chapel of your choice with your license, identification and payment for the wedding. If you’ve gotten a limo service, be sure to tip the driver. Prepare to enter your marriage in style!